Wanna show your friends how much you love them? Haven’t had the guts to tell that cutie how much you adore him/her? Wanna thank your big but don’t know how to? Pepero Day is the perfect opportunity for you to finally do all of these things and more! buKSA is going to be selling Pepero grams for only $3. A gram consists of Pepero sticks (not a full box) in an adorable package plus a personalized message! The best part is, we’re going to deliver to anyone living ON CAMPUS. 빼빼로 (Pepero) is a long thin cookie, dipped in chocolate. Pepero Day is somewhat similar to Valentine’s Day and is held on 11th of November, since the date “11/11” looks similar to four sticks of Pepero. 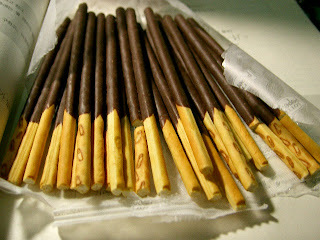 To celebrate Pepero Day, people exchange Pepero sticks with their friends and family. Then confirm your order by going to the GSU Link on Wednesday (7th) or Friday (9th), anytime from 11am-5pm to pay for your order. You can also put in orders at this time–we’ll have our laptops there. We ask that you figure out yourself where you want the gram to be delivered to. Ask a mutual friend or do some creeping, it shouldn’t be too hard. Worst case scenario, have the gram delivered to yourself and then you can personally deliver them later. Unfortunately, we are not delivering grams to off-campus apartments. You can have the grams delivered to yourself and then you can personally deliver them wherever your heart desires.